Fresh off the heels of the iPhone 7 launch, many Apple users can’t help but feel neglected that similar updates haven’t been made to the Mac lineup. With Apple building its products thinner and thinner, something has to give. The most notable compromise of skinny Macs is the lack of graphical computing power. As of fall 2016 every Mac is in dire need of a refresh. While there are rumors updated Macs are coming, more powerful GPU options are likely limited. An eGPU for a Mac is what a sidecar is to a motorcycle; it adds capacity and utility only when needed while also remaining mobile. External graphics card enclosures (eGPU) via Thunderbolt ports may be the only solution going forward. Thunderbolt is a standard input/output in every new Mac computer except the MacBook 12″ retina. This port has very high bandwidth that supports high-resolution displays and high-performance data devices. An eGPU for a Mac is what a sidecar is to a motorcycle; it adds capacity and utility only when needed while also remaining mobile. No manufacturer is currently selling a complete eGPU solution for Mac. If you want an eGPU, you have to build it yourself. 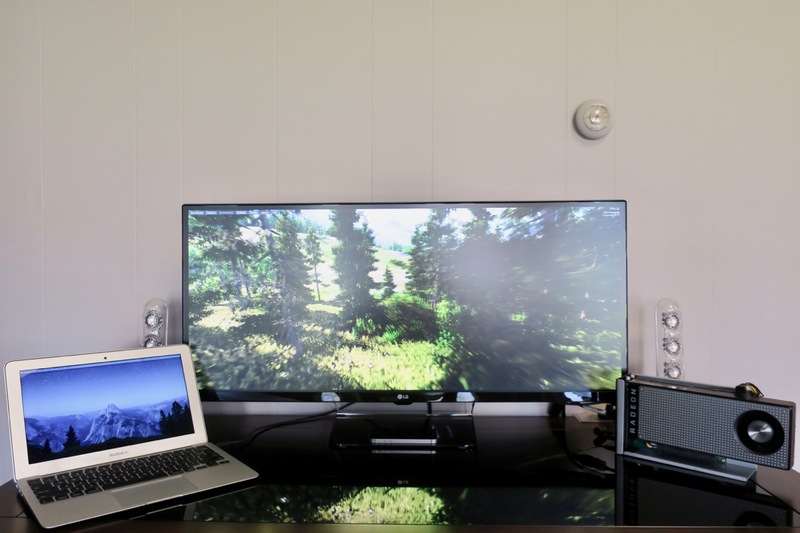 I’d recommend visiting eGPU.io – an eGPU forum for DIYers. 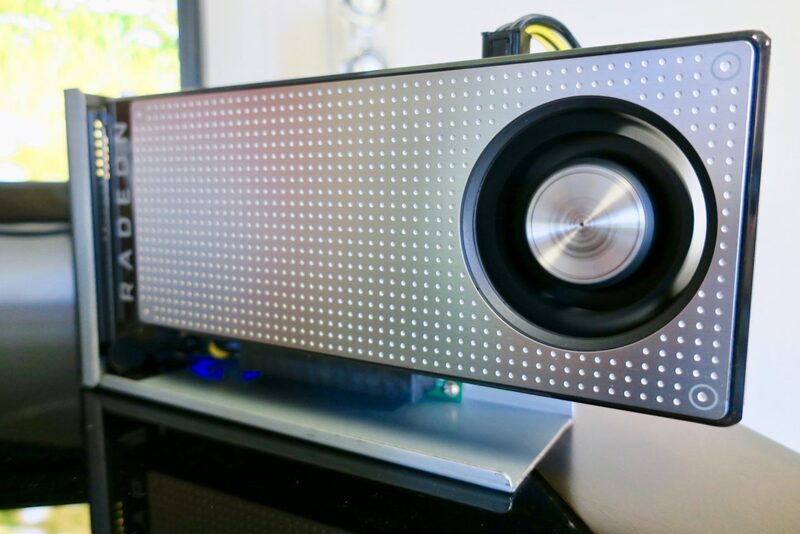 One of the most popular solutions for building an eGPU is to start with an AKiTiO Thunder2 enclosure. 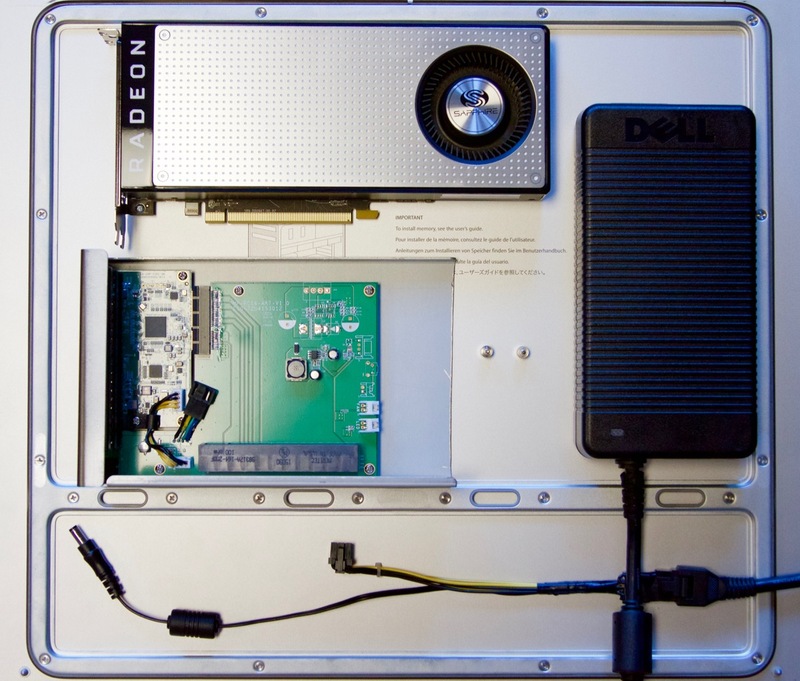 This enclosure has dual Thunderbolt 2 ports and a full-length PCIe slot. AKiTiO officially only supports low-power PCIe components due to its 60W power supply. This limits power delivery to the PCIe slot at 30W which is a no-go for most GPUs (they typically require 75W). To get around this hurdle, a prerequisite for an eGPU build is a 200W+ power supply. Some have used Desktop ATX power supplies with 500W+. Many are turning to a Dell DA-2 power brick which has an output of 220W. I replaced the AKiTiO power supply with the Dell DA-2. This power supply is popular due to its relatively low cost and portability. 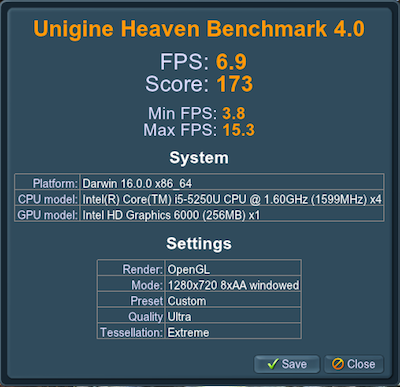 Last but not least you need a powerful graphics card. 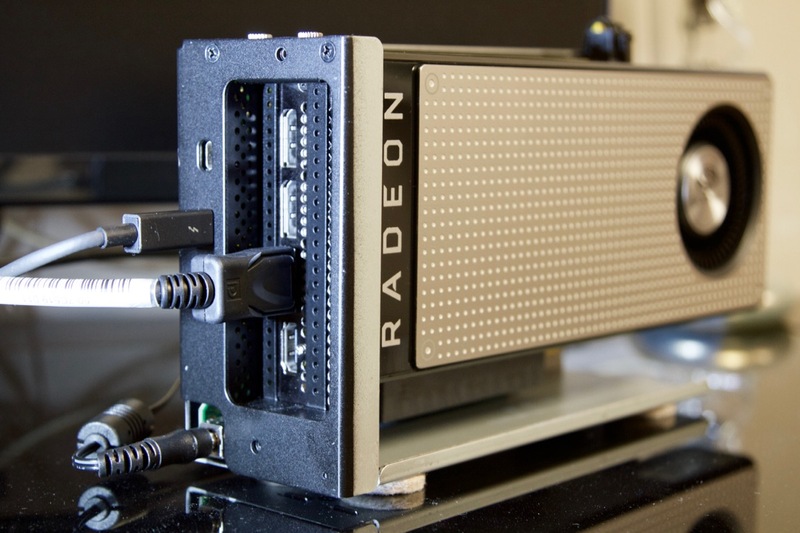 I’m using an AMD Radeon RX 470 graphics card which is part of AMD’s newest Polaris 10 lineup (RX 480 works as well). 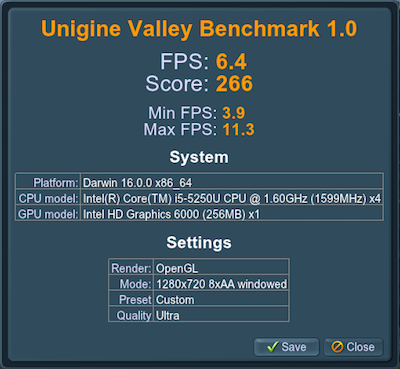 I chose this GPU because of its 120W TDP power requirement. There’s no official driver support in Mac OS X. However, macOS Sierra 10.12 has drivers which can be modified (AMDRadeonX4100.kext) to make use of Polaris 10 GPUs such as RX 470 and RX 480. Similar to most external peripherals, the eGPU has a few connections out the back. I modified the Dell DA-2 to have a barrel plug to power the AKiTiO Thunderbolt/PCIe board and to have a PCIe 6-pin power cable to power the RX 470. The AKiTiO Thunder2 enclosure communicates to a Mac through a thunderbolt cable. A DisplayPort cable connects the graphics card to an external display. I’m using a MacBook Air 11″ to demonstrate the performance gain this eGPU provides. All current Macs could use the performance boost from a Thunderbolt eGPU except the tower Mac Pro which has PCIe ports and can use newer graphics cards internally. The improvement is significant. 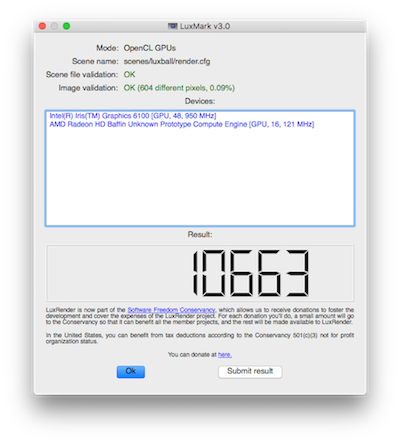 These benchmark scores show the Radeon RX 470 Thunderbolt eGPU performs 8x faster than the Intel HD 6000 integrated graphics card in the 2015 MacBook Air 11″. 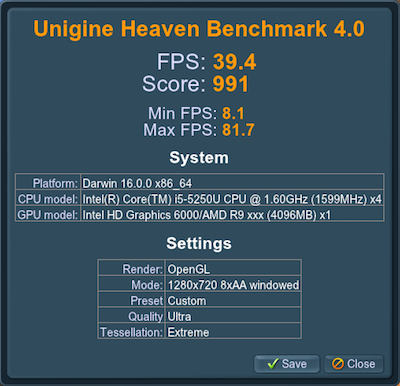 As excited as I am to see these scores, building a Thunderbolt eGPU is only a stopgap. Many professionals who use Macs for their daily work are finding it harder to stay within the ecosystem as the graphical computing performance is not meeting their needs. At the end of the day, Apple needs to step up its Mac game to rekindle the enthusiasm of its most loyal users. Update: If you have a newer Mac with Thunderbolt 3 ports, you can read my post on Thunderbolt 3 eGPU for 2016 MacBook Pro. To build an eGPU for your Mac, read my eGPU Beginner’s Setup Guide. For latest eGPU development, visit eGPU.io.